Many communities in Canada, particularly those in rural areas, suffer from a shortage of physicians because the distribution of family physicians is inadequate and inequitable. For example, in 2000 there was an average of 94 family physicians per 100 000 Canadians. Some communities (typically urban areas) had 140 family physicians per 100 000, whereas others (typically rural) had less than half that number.1 Many doctors who choose to work in rural areas do not remain beyond minimum period of their contractual obligation. One way to relieve physician shortages is by licensing more international medical graduates (IMGs). Every Canadian province uses IMGs to varying degrees to bridge the shortfall between the demand for primary health care and the supply of services by Canadian medical graduates. Recent evidence shows that about one-quarter of physicians practising in Canada received their basic medical education from another country.2 This figure does not, however, reflect the variations and dimensions of the IMG workforce across the provinces. Physician licensing falls under the jurisdiction of the medical regulatory authorities in each province. Forms of licensing vary by province, but there are 2 general classes: full and provisional. The requirements for a full licence in Canada are nearly uniform, with the standard requirement being the Licentiate of the Medical Council of Canada. In remote and underserviced regions of Canada, medical services provided by provisionally licensed IMGs are vital.3 Typically, provisionally licensed IMGs are hired to meet an immediate shortfall of physicians; they obtain a provisional licence to gain entry to practice and tend to fill positions that Canadian medical graduates will not take. To determine the utilization rates of provisionally licensed IMGs in Canada, we asked the licensing authorities in each of the 10 provinces to provide the number of provisionally licensed IMGs registered in their province in 2003 and the 5 most common countries of origin of those IMGs (see online box, available at www.cmaj.ca/cgi/content/full/173/11/1315/DC1). These data were linked to the Canadian Medical Directory to provide province-by-province estimates of the proportions of the physician workforce that are provisionally licensed IMGs and fully licensed IMGs. We found wide variation in the proportion of IMGs practising in each province. 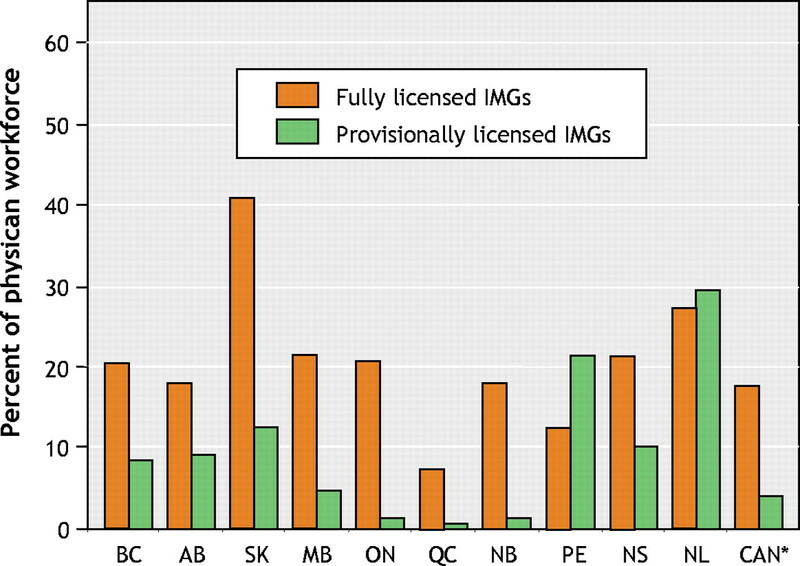 For example, fully and provisionally licensed IMGs constitute over half of the physician workforce in Newfoundland and Labrador and in Saskatchewan but only 8.0% in Quebec (Fig. 1). The differences in the use of provisionally licensed IMGs are even more striking, with some provinces licensing very few (e.g., Quebec, New Brunswick, and Ontario) and others far more (e.g., Newfoundland and Labrador and Prince Edward Island). Fig. 1: International medical graduates (IMGs) practising under full and provisional licences as a percentage of total physician workforce by province. *Does not include data from the territories. A provisional license offers an expedient path to full licensure, even it means working in a place that is not an IMG's preferred location. Upon receiving a full license, IMGs are mobile, and many then relocate within Canada. Many communities thus face a regular and rapid turnover of physicians. The evidence suggests that some provinces are “entry points” for IMGs to obtain licensure and full mobility in Canada. Provinces that face continuing problems finding physicians to work in rural and remote locations offer provisional licences to IMGs seeking to relocate to Canada, with the agreement that they work a fixed term of (normally) 2 years. This 2-year window coincides with the length of time required in clinical practice before a physician can qualify for a full licence. Given the worldwide shortage of health care professionals, there are ethical concerns surrounding the recruitment of physicians from developing countries: should a wealthy country like Canada “poach” physicians from less affluent countries that have invested significantly in their training and where their services may be in greater demand (although less well-compensated) than in Canada? The counter-argument is that people have a right to self-determination, and if IMGs meet a particular need, they should be allowed to emigrate and work in their chosen profession. The compromise that has emerged is that Canadian medical recruiters are not supposed to actively recruit an IMG until that person has expressed an interest in emigrating. High physician turnover in rural and underserviced regions is a serious problem in Canada. Continuity of care is highly correlated with a patient's satisfaction with the physician, and, as such, the relationship with a family physician is ideally long-term. When a family physician is present in a community for only a short period, a long-term relationship cannot be established. There are 2 notable implications to our findings. The first is that some (poorer) provinces that rely heavily on provisionally licensed IMGs may be serving as an initial screening mechanism for other (wealthier) provinces that wish to recruit fully licensed IMGs, allowing them to avoid granting provisional licences. The second implication is that only the most able provisionally licensed IMGs can relocate, whereas those who struggle to meet Canadian standards remain immobile. The rapid turnover of newly qualified IMGs out of rural and remote areas is a particularly worrisome trend. Recruiting a new physician, particularly from abroad, is expensive. Replacing physicians every 2 years requires a considerable outlay of financial resources that would be more efficiently spent on the actual provision of health care services. Acknowledgements: We thank Atlantic Metropolis (Economics Domain); the Newfoundland and Labrador Department of Human Resources, Labour and Employment; the Harris Centre and Faculty of Medicine, Memorial University of Newfoundland; and an anonymous donor for financial support. Canadian Labour and Business Centre. Physician workforce in Canada: literature review and gap analysis. Final report. Ottawa: Task Force Two: A physician human resource strategy for Canada; 2003 Jan.
Federal/Provincial/Territorial Advisory Committee on Health Delivery and Human Resources. Report of the Canadian Task Force of International Medical Graduate Licensure. 2004 Feb. Available: www.aipso.ca/Task%20Force%20Final%20Report.pdf (accessed 2005 Sep 30). Nasmith L. Licence requirements for international medical graduates: Should national standards be adopted? CMAJ 2000;162(6):795-6. Unnecessary distraction for specialist physicians.